What do you look for when going shopping for sleepwear? Comfort? We're taking sleepwear from tiring to magnificently strong! DREAM ALL NIGHT: Enjoy restful, comfortable, sweat-free nights with these 100% cotton sleep shirts for women. The nighties allow your skin to naturally breathe, keeping you nice and cool even on those particularly warm nights. LOUNGE IN COMFORT: With a roomy fit and super soft jersey knit fabric, these jammies for women make for truly comfy lounge wear. 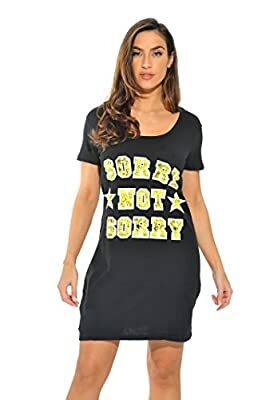 HAVE SOME FUN: Beat the boredom and blast away the blandness with the vibrant colors and funny captions on these cute pjs for women. Choose between our range of beautiful designs for a nighty that will match your taste and make your days. DESIGNED TO LAST: With great stitching, perfectly-lined hems, and the highest quality printing, these sleep t shirts for women and teens are designed to last you through countless nights. Toss them in the machine whenever they need a clean and experience some of the best-washing nightdresses. GREAT VALUE FOR MONEY: Just Love prides itself in giving you the trendiest women nightwear at prices that won't break the bank. Enjoy comfy sleepwear for women that emphasizes on superior quality and style. Click 'Add to Cart' now!